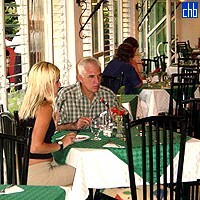 Los Helechos Hotel is located inside the Topes de Collantes National Park in the heart of the Sierra Escambray, 5 km above the city of Trinidad, Sancti Spiritus. Topes de Collantes is an area of more than 12,000 acres of forested mountains & river valleys. It's a perfect base for exploring the mountains. Several hiking trails begin within a stone's throw of the hotel. After hiking or horseback rides, you can do some laps in the swimming pool in a huge solarium, or relax in a steam room. 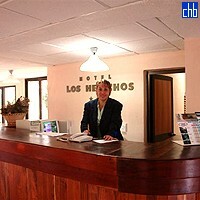 Hotel Los Helechos is a complex of 3 buildings; the lobby of the 3 star hotel Los Helechos has osier reed and natural fiber furniture. 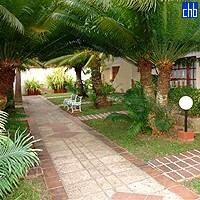 The rooms and cottages are located near the lobby. To reach the hotel, the paths and roads have steep inclines, making the climb by foot sometimes a little bit hard after a long walk. The view from the hotel is stunning and worth the stay for that alone. 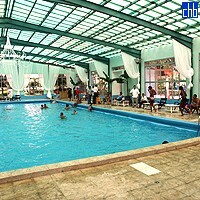 The facilities of the hotel include thermic swimming pool, gym, massage, sauna, steam baths, a small disco with shows and entertainers and a tourist desk where you can book various tours to visit places of interest of Sancti Spiritus province. The city of Trinidad and the beach at Playa Ancon are short distance away by taxi or hitch-hiking. There is also a place, about 500m from Los Helechos hotel, where one can erect tents or hammocks. A nice and welcoming cafeteria near the hotel (100m) where you can have a little break and cup of coffee after a long day of exploring the region. 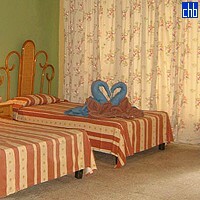 Standard rooms are very basic but all have a magnificent view. 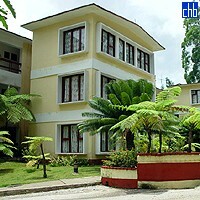 All equipped with air conditioning, private bath and telephone. Topes de Collantes se nachází pouhých 5 km nad Trinidad. Jedná se o přírodní park s více než 12 000 hektary půdy, kde se hory, moře a kulturní památky spojují v jednom vysoce kvalitním turistickém produktu mezinárodní poptávky. Je to místo výjimečné krásy a velkého vědeckého významu pro kubánskou botaniku, zoologii a ekologii. Tento postoj je chráněnou oblastí o rozloze 200 čtverečních kilometrů s velkým počtem endemických druhů flóry a fauny.